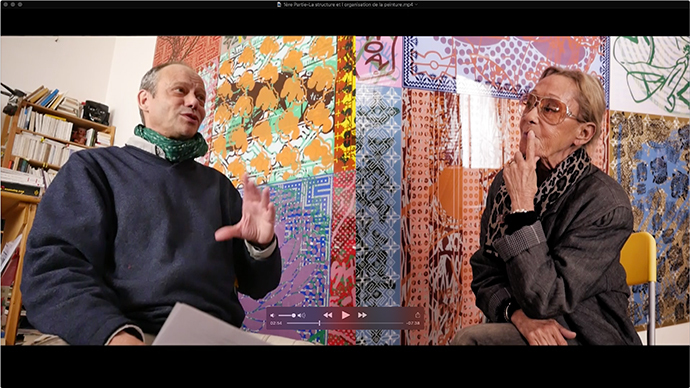 These eight video interviews were filmed at the Jean-Pierre’s studio in Besançon on the 6th and 7th of October (2016) by Lionel Georges with sound recordings done by Christine Chatelet. Marie-Madeleine and I had been planning these interviews for more than two years. We had discussed them during numerous meetings at the workshop or during meals together when Marie-Madeleine had returned to Besançon from her many travels during her job. So it was with great joy and emotion that we finally found ourselves together with Lionel and Christine, during those days in October 2016, for the shooting of these small films. The videos will serve mainly to share the enthusiastic, pertinent, and joyful comments of Marie-Madeleine about my work. We also hope that these videos will facilitate the understanding of Art in general and the openness to welcome this Art in our hearts, as a salutary and conciliatory nourishment for the spiritual development of everyone. - Beyond the painting in metaphysics?